"Oh my gosh, I'm so sorry!" Marlene Castro is apologizing for cheese. "The cheese is bad. That's why already I no serve anymore the nachos -- nacho cheese." 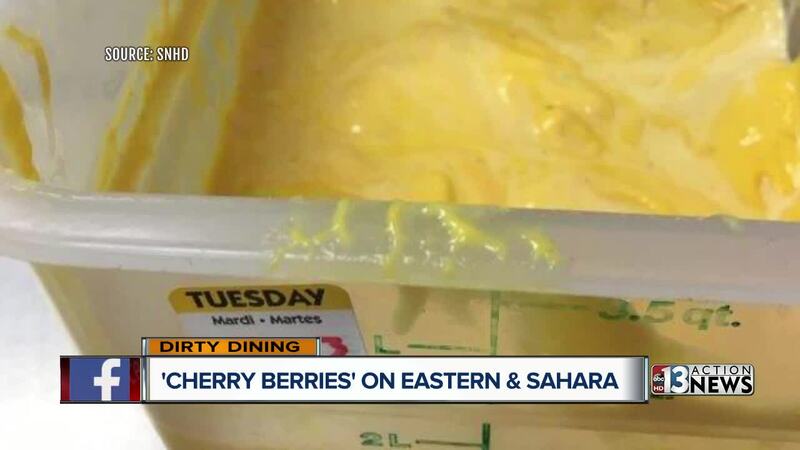 The nacho cheese at Cherry Berries on Eastern and Sahara was coated in a skin of mold and more than a month old when inspectors found it on May 11. The inspection resulted in a 40-demerit C grade. "For seven years, this is my first time. Normally everything is clean, everything is good. Only this one day, my bad day." It's true that she's never had a C before. Even so, she thanks the Health District for the wake-up call. "Thank you for coming because it reminds me I have to be more careful for my family and my customers, especially my customers." A dirty cutting board stored as clean and another one excessively dirty with old food debris. Fruit was not washed before being prepped. Chicken, tomatoes, lettuce and hummus all had to be thrown out because they were in the temperature danger zone. "Because I have a lot of customers and working by myself, because everything is crazy, everything is messing up in the back." We found a violation in the front, too, when we looked for her C grade card. It was on a shelf in back and when an employee brought it out, it was covered up by an old A grade. Cherry Berries still has a C grade. Marlene says she's scheduled reinspection for next week. She takes us into the kitchen to show how she's cleaned things up and everything looks good aside from a spot on the grill and a bunch of uncovered fruit subject to contamination in the fridge, which she instructs an employee to cover after we point it out. We have two food trucks closed for imminent health hazards and both are three-time Dirty Dining repeat offenders. Kenya's Catering #2 truck was taken off the road May 8 for inadequate refrigeration. And El Buen Taco got shut down for the same thing May 9. Their number two truck was put in park because it couldn't keep food cool enough to be safe. Also, an employee's wallet and keys were touching food in the prep cooler. Both food trucks were back to zero-demerit A grades the next day. Kenya's did not return a call for comment. El Buen Taco issued this statement: "The problem with the inadequate refrigeration was that our generator might have turned off, so when the inspectors came, that is why it was not up to standards." They said that same day they called the inspectors to come back and check, and they were fine and were able to keep operating the truck that same day. They said they have complied and have had no more problems. We should note that Health District records show the reinspection took place May 10 and the closure was on May 9. There were a slew of other closures May 9, all for no hot water at the Primm Travel Center near the Nevada/California state line. The closures came at Qdoba, Subway, Starbucks and the Primm Center snack bar. All share the same hot water heater. In addition to the lack of hot water at Qdoba, there was black mold on a cutting board and pink mold in the ice machine. There was also some pink mold in the Starbucks ice machine. And at the snack bar, inspectors found expired milk. The vice president of food operations for Primm Center II said the closures were pretty straightforward and that their Engineering department worked quickly to fix the water heater and get everything back open within about two hours. All reopened with zero demerit A grades.